At least, I think it’s a saucer. My hands have been needing some limbering up for a while, so I started back into my tea set. I also started watching Bones, so I can have something to keep me company while I work. I like it. No idea why I have never really seen it before, but I’m sure it’s my fault, haha. Thanks to ups and downs, I managed to get the saucer outlined completely in dark blue over the course of… well, what amounts to two afternoons. There’s also some light grey in there, which you can barely see right now. It’ll show up better later, when I get more colours in there. Looking forward to this weekend, but also kind of nervous. I got a miracle rheumatologist appointment for tomorrow, and I still haven’t filled out all of the forms and things. And I’m borrowing my mum’s Handicapped Parking pass until I can get mine. No idea how long it’ll take me to get used to looking for and actually using those spaces. My cousin is also graduating and having a related open house the following day, which we have also planned for our fabled hot springs trip. For some reason, I just don’t feel talkative or wordy right now. Maybe I’m in too introspective a mode. Or not enough of one. 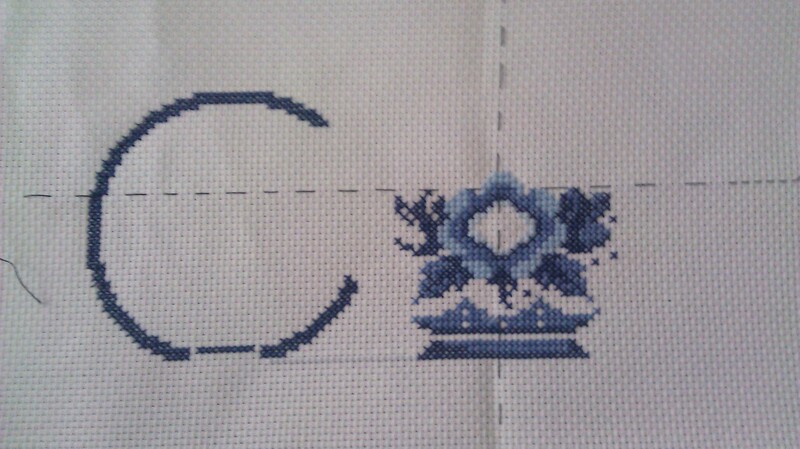 I could explain that I’m doing a cute little dolphin cross-stitch for my friend Amy. That I started it today and although I made up my own crappy and impatient version of the back stitch, I finished the major outline. I could. But I’m going to sleep instead. At last, I finished the griffin and I can start wondering what to do next. I do have my teapots, but that won’t be quick. Then again, there is some writing that I have to do. It’s the reason that I didn’t post on the weekend. 2500 words on Saturday and then a measly 1000 on Sunday. It’s a long chapter, so it’s not done yet. I’d like to finish it today, but that isn’t likely. Still, I feel accomplished right now. I’m just making a quick picture post to show that I’ve between able to get a little bit done today. I finished the gold front of the griffin, and started on the blue half. Right now it looks like blue jeans, which bugs me, but at the same time it’s kind of hilarious. My brother and his girlfriend came by, and we all played Arkham Horror. I sewed while we played, and funnily enough, we had a rare win. I’m going to have to get some very light grey or white and some lighter red so that I don’t have those blank areas anymore. I think it’ll look nicer if everything is even. But then, I have OCD, so I could just be ridiculous. Sigh. It’s been a great day, but the people in the flat upstairs are being obnoxious. It’s after midnight and they’re taking so loudly that I feel like an eavesdropper. Management just circulated a newsletter informing tenants that our community has quiet hours that begin at 22:00 and end at 10:00. I guess the people upstairs think that weekends are exempt. Not the best way to end a post, but they are really incredibly loud and Swype is dropping my intended words in favour of total gibberish. This was a busy week. The last two days were where I really felt it, and it won’t be over until the end of this upcoming week. It’s funny. I only finished single stitches for the front half, but it’s taken quite a while. I think I get lost in the simplicity of filling it in and think I’m taking too long. I am in need of a nap. Probably not going to get one. This may not be the best time to watch weird, think-y movies. I have never really had a concrete way of delineating these posts, so I figure, why bother now. Today didn’t offer a lot of free time, but I got all of the fiddly bits done. Luckily, just when I was getting irritated with the talons, I was about done with them. Now that I have the colours to do, I wonder if I should do each half in a different colour. Blue for the bird and gold for the lion-y bit. Gotta run now. Hopefully more later. Today probably should not be repeated. I woke up early and installed myself in front of the telly with my griffin. I got up to make meals and the like, but I ended up spending pretty much the entire day stitching. I also finished another book. But considering that my right index finger and thumb have been visibly (and rather painfully) swelling for a while now, I’m likely going to lighten up a little bit. The problem is two-fold: I have problem hands, pain-wise, and I tend to hyperfocus. The latter is especially bad when it’s something that I’m enjoying with very little difficulty. If I could just bottle it or control it somehow, I’d be golden. Also riddled with pain more often. I can’t open a water bottle on my own anymore. Eheh. It’s a trade-off, right? Bragging doesn’t come easily to me–not consciously, anyway–and I’m also a total newbie, but I think this is probably pretty good for three days, especially since my efforts in everything else has been so disappointing. I’ve been taking all of these pictures with my phone, and this is quite possibly the clearest picture I’ve taken with it. 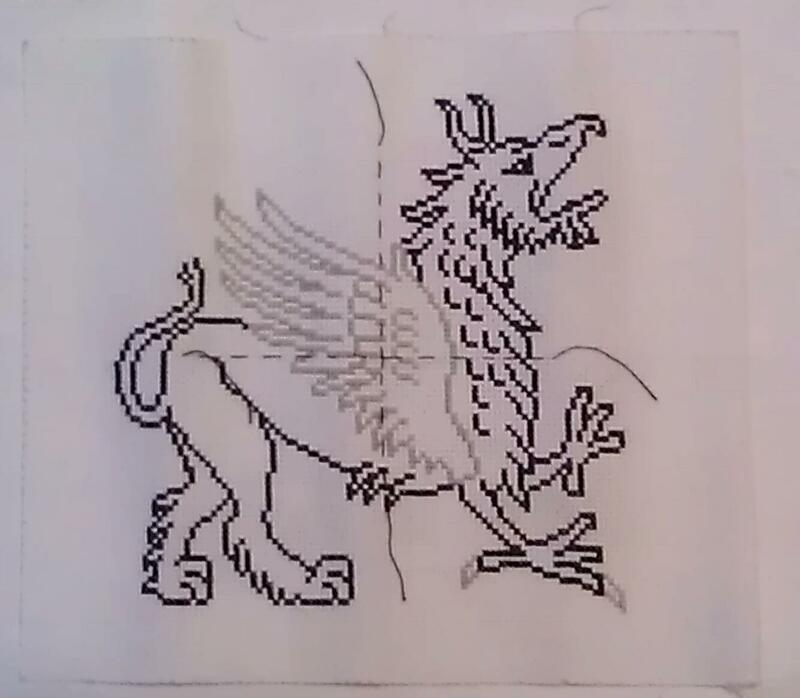 So now all I have left are the griffin’s talons, tongue, tail, and then I have the outline done and I can start on the colour. I’d like to try to incorporate shading, but I haven’t planned for that, and I think it’s best to keep it simple. I can try complicated another day. Someday, I could try my own designs. It’d be weird to see my square-headed tiny people on fabric.